Graphite filled, conductive, compression mount material for hot embedding. 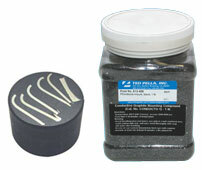 Ideal for SEM, EDS/WDS and electro polishing applications. Hard embedding material with low electrical resistance and excellent edge retention. Enables imaging and analysis of clean, uncoated sample surfaces of conductive materials in the SEM, FESEM, EPMA or FIB systems. Hot embedding press is needed to use this embedding material. Embedding temperature 165°-200°C (330°-425°F) with a moulding pressure of 17-28 MPA (2500-4000 PSI). Typical curing time is 5-10 minutes.